No, I did not fall off the wagon. This was purchased before I went on the lippie ban (and I have a few more stashed cause...you know). Having a drugstore located right downstairs (and another one across the street) is a very convenient (difficult) situation for a beauty addict like me. This was another impulse buy when I innocently went downstairs to grab some water. Of course, I had to go through the cosmetic aisles (which is on the opposite side of the water section). My eyes sometimes work like the hawk's, I immediately noticed these were new although the tubes looked just like the other Super Lustrous lipsticks. I wouldn't say this is an entirely new but rather an addition to the existing line. There are creme, pearl, and matte finishes available in the Super Lustrous range. Now we have the "shine" finish as well. The difference in finish is well marked on the bottom of the Super Lustrous lipsticks. This one even comes with the foiled sticker indicating the "shiny" finish. According to Revlon, this new lipstick has "a silky lightweight formula with moisturizing shine". 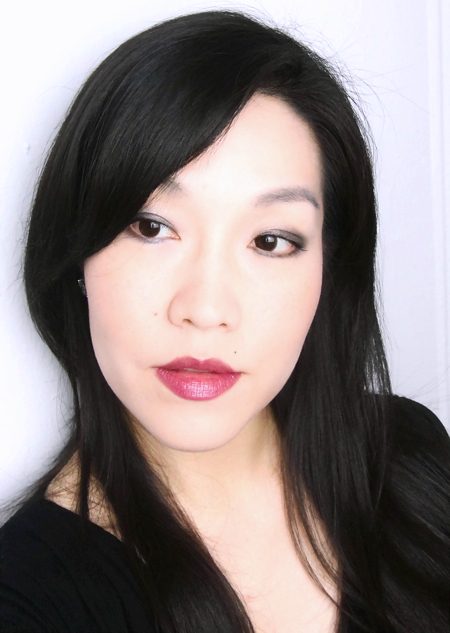 I chose Plum Velour cause I always look for an easier way to wear deeper lip colors, and it is autumn after all. 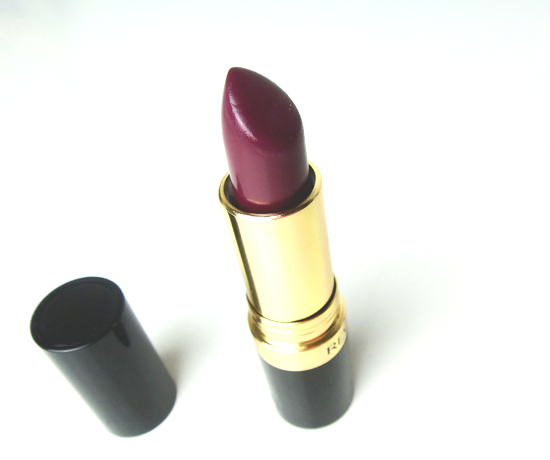 Plum Velour is a deep plumy wine with a bit of brown undertone. Some say the new Shine lipsticks seriously lack pigmentations, but I disagree. At Least Plum Velour comes with more than enough colors. Honestly, I am a little torn about this lipstick. It sure is a nice one for the price and quality plus it delivers what it claims. The color glides on the lips feeling very light and moisturizing, and the intensity of it is easily controlled as well. The problem I have with it is that I don't really "love" the color. Maybe I was expecting something like Clinique Almost Lipstick Black Honey or something (speaking of that, I really want to have another stick of that...hmm). It is my mistake since the description of it never includes the "sheer" part. Now I understand a light weight lipstick with shiny finish doesn't have to be sheer. Aha. I compared this to two other similar colors I own. 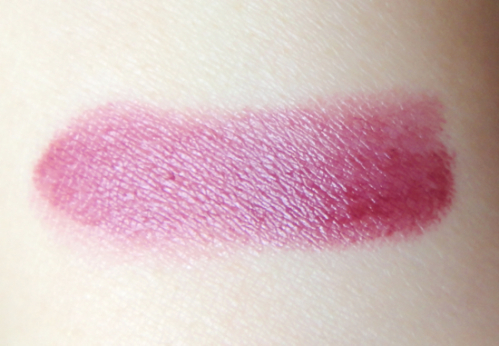 Revlon Plum Velour is a more wearable version of Revlon Black Cherry, but it isn't as half beautiful. I tried both colors as stain (unfortunately, this is the only way for me to wear these colors), and I clearly prefer Black Cherry although this is a very difficult color to play with (but once you get it right, this is so gorgeous). 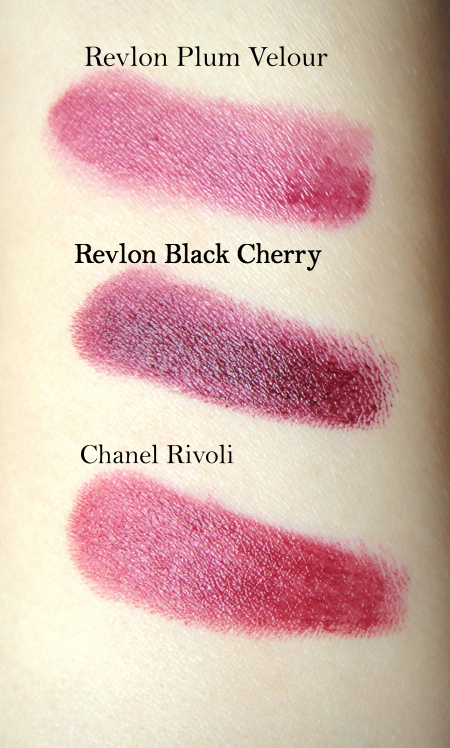 With a couple of swipes, Plum Velour looks quite similar to Chanel Rivoli. However, I would prefer Rivoli since it is more flattering on me pulling a little bit more red and it wears better. Plum Velour migrates a little due to its waxy and rather slippery consistency. Here are a couple of overall looks. This is with a couple of coats. 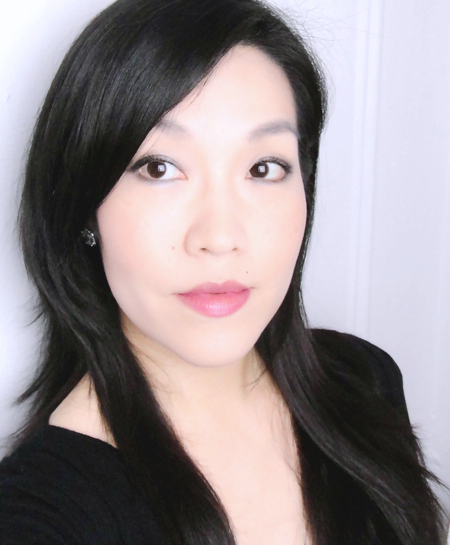 For me, Revlon Super Lustrous Shine Lipstick Plum Velour comes a little short since it does not give me the convenience of easy wear nor is this a must-have color for me. It is another great drugstore lipstick range for sure, though. I myself might have thought a little different if it was easier color (for me) to wear. It seems they are adding more colors (ten for now), I would give them another try in the future. Have you tried the Super Lustrous Shine lipsticks?